Heidelberg feels less a town and more a university campus. Arriving from the industry laden north, we’re suddenly in the land of bicycles, scrubbed smiles and yoga mats. Heidelberg has a population of 150,000, a third of which are students. In the summer, they’re replaced man-for-man by tourists, gaggling in the cobbled streets, selfying under the Schloss and monkeying around with the Heidelberg baboon. Already in May, American tourists order show-off steiners of beer and eschew the old town Grundel bakery for a sympathetic Starbucks next door. Heidelberg, a tourist's eye view. Our host Manuel has been a student here for six years and is only now reluctantly finishing up his undergraduate thesis in Islamic Studies. In Germany, he tells us, university studies have traditionally been a personal pursuit whose goal was becoming a better person. A couple of years ago the EU-wide Bologna agreement moved this continental model of higher education towards the more industrial British system, which favours quantifiable results and unambiguous academic productivity. We join Manuel in the evening for a lecture on the history of migrant and minority protests in Germany. The audience bang the tables with their fists to greet the lecturer, Simon Teune, who describes how Jews protested the desecration of their cemeteries after the second world war, how Turkish migrant workers went on strike for their rights, and how today the anti-muslim Pediga movement and the Alternative fuer Deutschland (AfD) right wing populist political party are inspiring new generations of resistance. Patrick Henry Village, an outsider's eye view. The next day, we cycle seven kilometers out of town to Patrick Henry Village, a former American army base that is now the holding camp for refugees arriving in the southwest of Germany. We’re not allowed inside, but refugees come and go, with free buses shuttling into Heidelberg. 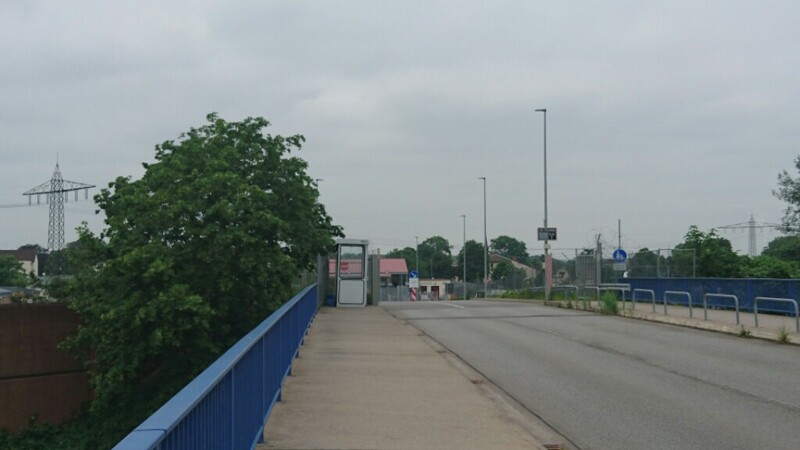 A dual carriageway separates the refugees from the town, and only one bridge leads in and out. Leaning on the bridge parapet is Saif, a man from the Western Sahara in his late twenties. Saif has a beaming smile and is thrilled to be in Germany, although he says it’s been a culture shock. It’s not just the cold weather, but everything is different: the way Germans do things, the things they say, the way they say them. He thought that when he was in Germany, everything would be easy, but it is quite the opposite. Saif is optimistic that when he learns German, he’ll start to understand and integrate into society. He studies twice a week in the camp and can’t wait to test his declensions on meaningful business. For now, though, he has to wait. He has been living in Patrick Henry Village for two months and only has one more month left on his temporary permit. Uncertainty awaits. 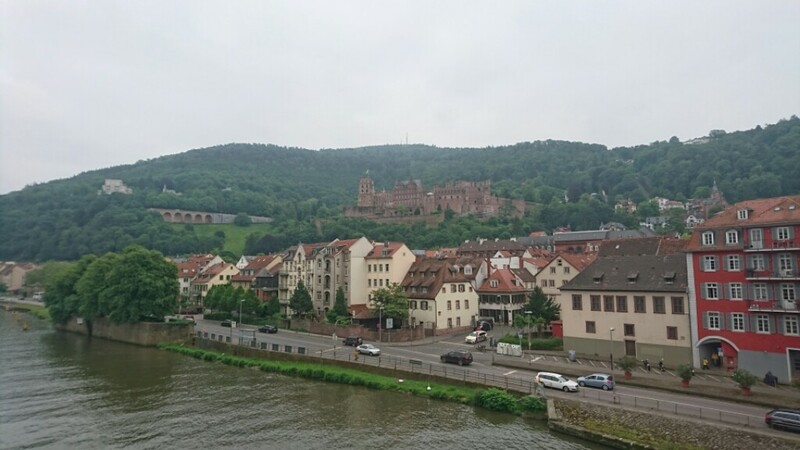 In the afternoon, we cycle back to Heidelburg train station for a whistle-stop rendez-vous with Regine. Regine works for a Karlsruhe evangelist church in their refugee and integration programme. She began her career working with refugees in the 1980s, and reminds us that Germany has welcomed migrants on a similar scale to today several times in the past, most notably with the fall of the Soviet Union and the wars in the Balkans. In 2014, 300,000 refugees arrived in Germany. In 2015, that rose to almost a million. This year, despite the border controls and the EU deal with Turkey, the numbers will still be in the hundreds of thousands. The contrast with the UK couldn’t be more stark. To compare the refugee situation in Germany with the refugee situation in the UK is to compare a dinosaur with a gecko. Yes, they are both reptiles, but that’s missing the point. The UK has pledged to take 20,000 Syrian refugees over the next five years. Last year in the city of Mannheim alone there were around 15,000 refugees. Why is this so different? Regine can’t really say. ‘Germany is a migrant nation,’ she says, and tells us about the invitations to immigrate extended to Russian Jewish communities and Kazakh Germans. After the sparse Eifel region, Mannheim is the first place in Germany where we’ve really seen the effects of migration, largely in the delicious felafel and kunefe of its Turkish restaurants. Part of Regine’s job is to support the thousands of volunteers who have taken a more active role in welcoming refugees, by becoming mentors and friends to the newcomers. It’s not just German volunteers either: in Mannheim there are over a hundred clubs and associations for all nationalities – Iraqi, Turkish, Macedonian, Eritrean, Italian. What’s interesting is that so much of the support work for migrants is done by such volunteer and church groups. Regine’s church is dedicating over 10 million Euros over the next three years to their refugee integration programme. This popular support is, of course, a very good thing, but even in Germany, where so many more migrants have been accepted, not everything is perfect. The church tries to treat everyone the same, but the law does not. Regine tells us that four nationalities in particular have favourable treatment: Syrians, Iraqis, Iranians and Eritreans. Refugees from these countries get fast-tracked applications, which includes immediate integration support in the form of language instruction. These are the ‘good’ refugees; everyone else must wait 3 or 4 years before they can start playing their part in society. Other nationalities are fast-tracked in a different way: those from the Balkan countries have no grounds for asylum and are sent back within a couple of weeks. Regine has also seen a polarisation in German society, between those in favour of migration and those against. Towns like Leipzig and Dresden in the east of Germany have seen constant protests and counter-protests by far right and left groups. Even in the west, far right parties like AfD have been making gains. Recent local council elections in Baden-Wurtenburg saw AfD candidates win seats. Regine blames this trend on radical reducations in social services. This squeezes the poor and the lower middle and part of her work in the church is to try to make sure that Germans don’t feel excluded in all the outpouring of concern for refugees. The church runs a choir of jobless and refugees in Mannheim, where all nationalities can sing and perform together. As we prepare to leave, Regine looks up to the television that plays in the cafe. Angela Merkel is speaking from a lectern, about reforms to the integration law. The law sounds reasonable enough: a stop to unlimited financial support for people who fail to find a job or learn German. But Regine’s worried things will get worse. She’s sceptical that the state will support the programme of integration with enough money. And then how can they expect refugees to be independent of the state, if they don’t have the resources to learn German and find a job?